The NDIS has published the current demographic information of approved NDIS participants in Australia, and the breakdown by disability area (http://www.ndis.gov.au/part3-participant-1). 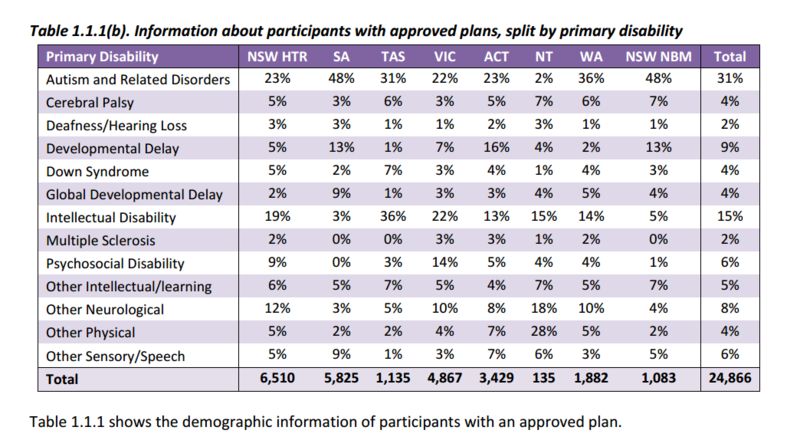 Participants with Autism and related disorders represent the highest proportion of approved plans overall, at just over 30% nationally. With Autism Spectrum Disorder (ASD) being highly funded by the NDIS, the relevance of ASD features and characteristics being represented in Smith-Magenis Syndrome (SMS) becomes particularly important in the NDIS planning process. The paper attached below, published in the American Journal of Medical Genetics, details the overlap of ASD in SMS. The results of this study suggest that the majority of patients diagnosed with SMS have related/parallel symptoms of ASD.